It's time for another Fjord of the Month! This month's Fjord is owned by dressage rider Wendy Luscombe. He dressages, he jumps, he hits the trails, he needs to be a model, and he also happens to be Ypke's half brother! Introducing Koriakin of Narnia! Personality: scarily intelligent, highly manipulative and very sensitive. Quite the personality to work with. Remember how I said he needs to be a model? Yup. ﻿﻿﻿﻿How did you first get involved with Fjords? How did you acquire Koriakin? I first got involved with Fjords in 1999. I was at the Regional championships riding Arabs when I saw this lady with a Fjord. They did really well in the Regionals, but what struck me was her relationship with her Fjord, how easy he was to be around and how much they adored one another. I was smitten and bought my first Fjord, Kingston, from Beaver Dam Farm. Kori was my second Fjord, he came through Beaver Dam where he was for sale on consignment from the Narnia Stud. He travelled from Narnia in British Columbia to Nova Scotia, where BD was, to me in New York. What has been your greatest accomplishment with Kori so far? 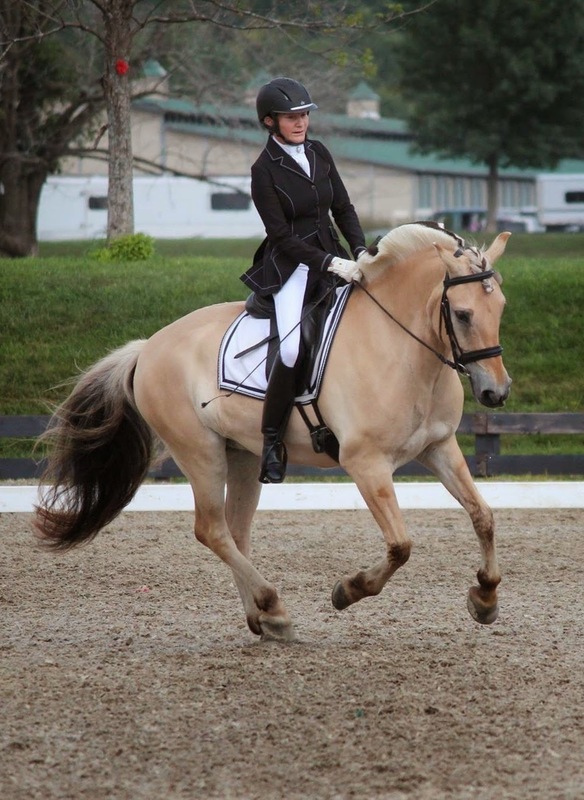 From your experience, how do Fjords compare in dressage to the usual warmbloods that are commonly seen? What are some of his quirks and favorite things? When Kori decides he does (or does not want) to do something he will get his own way by manipulating me into doing what he wants. Kori definitely has me trained. I have known him to go lame when he does not want to do something and then go,perfectly sound when he has got his way. He also does "Poor Fjord" expression which is to put on this terribly pained expression to show how much he is silently "suffering." Does Kori partake in any disciplines besides dressage? Kori is amazingly athletic but does want his secret let out. He jumps and trail rides. He has competed in jumper shows and we hope to do a horse trials with him this spring. He also did a jumping demo last Fall at Equine Affaire and cleared 4'3". He really loves jumping and if he does not consider the jump to be high enough for him, he just jumps what height he wants. I have videos of him clearing a 3' high 4' wide over by at least 2'. He has also jumped the entire grid of 4 cavaletti - distance of over 20' just because he felt like it - Poor Fjord!